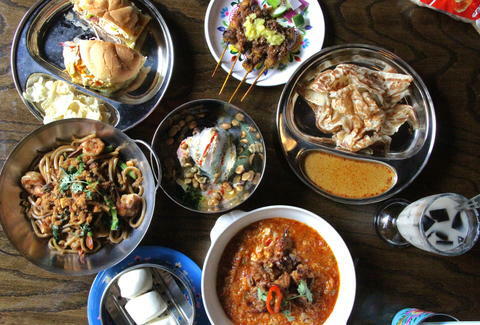 Set up to look like a series of stands in a Malaysian night market (complete with signs advertising different offerings, and a window to the kitchen that's set up like a roti stand), Pasar Malam on Grand St in Williamsburg is bringing the delicious hammer. 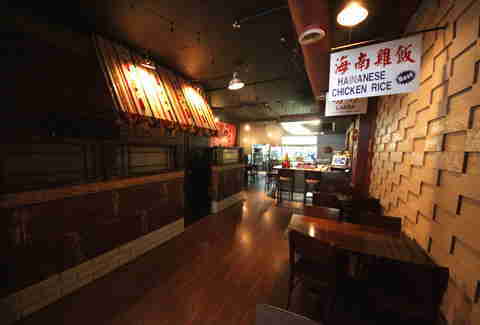 It opens up a bit in the back where the bar is, so make sure you get back there to see the mural (and drink at the bar). 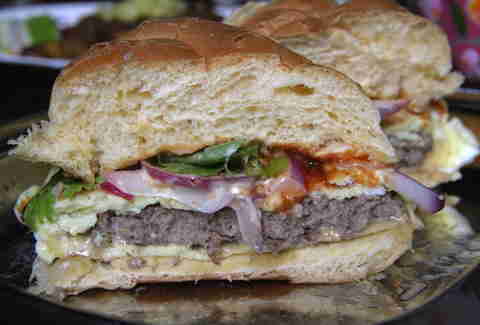 Behold, the egg-wrapped burger. It's loaded with Kraft American cheese, and finished off with Worcestershire, Maggi chili sauce, and Japanese mayo. 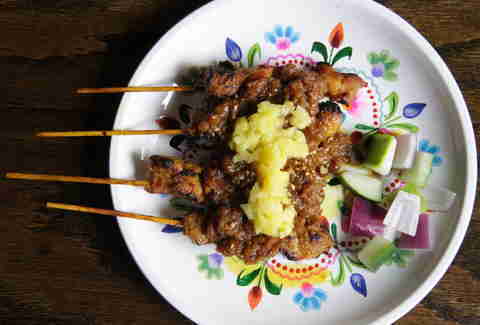 The Satay Babi (or for non-Malaysians, the "pork skewers") is loaded with crushed pineapples and a homemade peanut sauce. 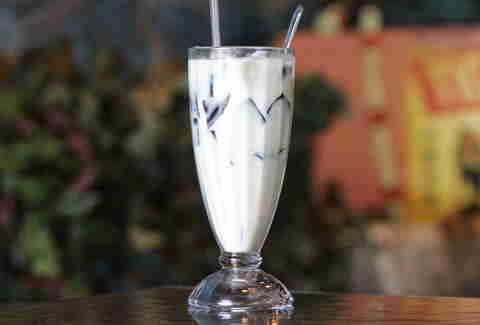 This is a required order. 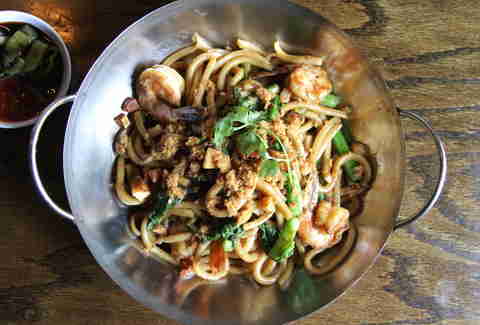 If noodles are your thing, the udon should get you going -- this bowl's packed with hunks of pork, crispy pork skin, shrimp, and veggies. 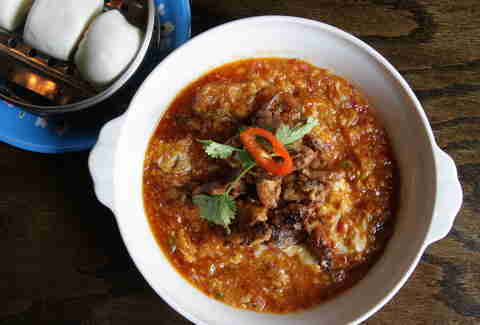 The soft-shell crab comes bathing in a pool of chili sauce, and accompanied by bao to soak up all the spicy crabness. And while there's no alcohol yet, the drinks will allegedly help cure what ails you (other than "not having alcohol in you right now"). Hot ginger Coke apparently cures a cold, and this "Michael Jackson" (because it's black & white) uses grass jelly, which has properties meant to cool you down on a hot day. 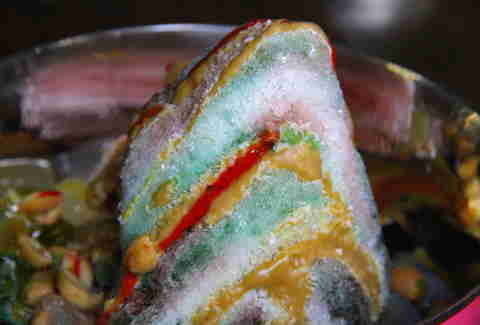 Satisfy your dessert needs with the Ais (pronounced ice), which is a mountain of flavored ice with homemade caramel, lime sauce, coconut jelly, grass jelly, and about a million other ingredients that all get mixed together and devoured as one. 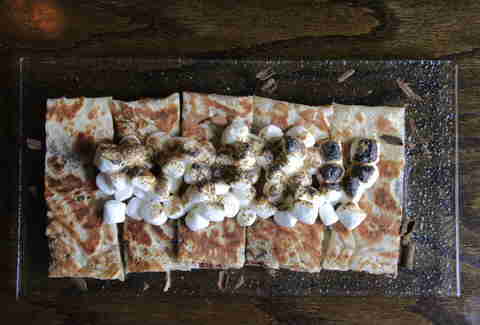 And an item from the "secret menu": s'mores (which are having a nice Summer so far) roti, with chocolate sandwiched between the layers and topped off with a pile of toasted mini-marshmallows, like all desserts should be. Andrew Zimmer is Thrillist's NYC Editor and sometimes he feels like he's been topped off with a pile of toasted marshmallows. Follow him on Twitter and Instagram.